Let me tell you… you are not alone in failing to reach your goals. There are countless numbers of people who make—and then break goals every day. But take no solace in the fact that you are not alone. Constantly failing to achieve your goals can be a tiresome process…while simultaneously stripping away your motivation. Life is about achieving! Whether that’s achieving feats like losing a certain amount of weight or climbing a mountain or just getting all of your paperwork done on time. These goals may seem hard to achieve—but with some smart goal setting techniques, you can be well on your way to constructing goals that are not only feasible, but achievable. Let’s take a look at what smart goal setting is really all about. 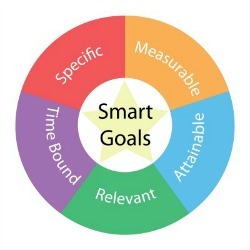 A smart goal is one which includes the following factors: specific, measurable, attainable, relevant, and time bound. Goals which do not fit all of these criteria are much more likely to be broken, especially by individuals who have a history of not keeping their goals. Each of these criteria is just a part of what makes achieving that goal possible… and are important in their own way. They should be measurable. Being able to measure your goal is another, often overlooked factor when it comes to constructing goals. You must be able to keep track of how close—or far—you are from achieving your goal, such as losing a certain amount of weight, writing a certain amount of pages...and so on. Ensure that your goals are attainable. Don't shoot for the stars in an unrealistic fashion. For example, losing 5 lbs. a month is more attainable than losing 30 lbs. in one month, isn’t it? Relevant goals are a part of smart goal setting because they should be applicable to you and your dreams and objectives. Beware of setting a goal because someone else told you that it would be a great objective for you. Good for them perhaps...but not good for you. This goes without saying. But let me say it anyway: You must put your goals in writing. Creating and holding them in your head amounts to barely more than a wish. All this may seem difficult at first, especially after a string of failed goals, but goals can be achieved! You just need to make sure that you use smart goal setting techniques for creating goals that are attainable.